Ideas for my first real blog post tossed back and forth through my mind. Should it be a recipe, a restaurant review, or perhaps a post about my new home? To make things worse the blog is still in need of a lot of updating – a new background and reassessing categories will make the whole page feel much smoother. But for the time being I decided to stick to what I knew best – a simple recipe that tastes fab and won’t leave you feeling guilty after just one bite. The last week really has been a bit of a mission, not just for me but for the whole family. Both before and after work I found myself trying to squeeze in moving house tasks like buying contents insurance, packing up boxes, or informing people about our change of address. It was absolutely exhausting. I may not have found it as stressful as everyone told me it would be, but it really did drain me right down to the core. Jon and I (that’s my partner by the way) had also decided that as part of our fresh start we would get ourselves back on a bit of a health kick. In hindsight perhaps moving house and going on a diet was a bit over ambitious. But, with both of us doing so well I decided that to keep us motivated I would bake us something tasty, at the same time as helping us get through the long days ahead. This actually worked out really well for my parents too – this recipe makes 12 good sized muffins and will last for 4-5 days in an air tight container. Jon and I couldn’t eat that many all to ourselves as they’re not entirely sin free, so Mum and Dad did the honourable thing and prevented any going to waste. Much like my almost-fat-free Banana Bread, the muffin mix is made sweet with honey and moist with ripe banana and stewed apples. 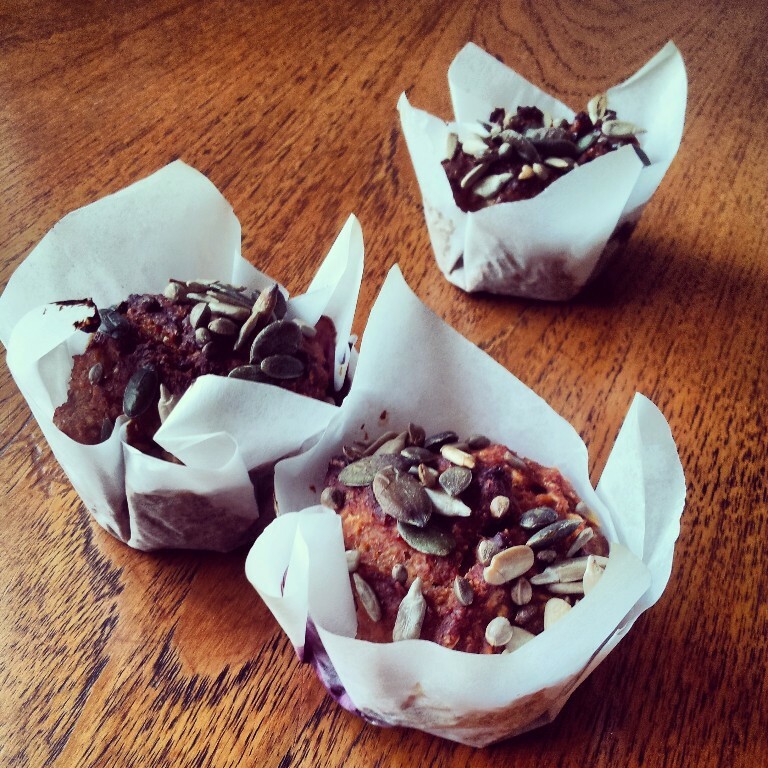 Wholemeal flour and oats give it a dense texture and seeds on top give a satisfying crunch! Pre-heat the oven to gas mark 4. In a small bowl whisk the egg whites until they form soft peaks. In a separate bowl mix the mashed banana, apples, honey, oil and yogurt. Ensure the wet ingredients are all fully combined before stirring in the blueberries. Next fold the egg whites into the wet ingredients trying to keep as much air in the mix as possible. Next fold in the oats, flour and cinnamon – again try to keep as much air in the mixture as possible. Finally spoon the mix into 12 muffin tins lined with paper cases. Bake in the centre of your oven for half an hour or until the muffins have risen, turned golden brown and a skewer inserted into the centre comes out dry. These muffins taste delicious either warm or cold and can be enjoyed for 4-5 days after baking if kept in an air tight container. You can find similar muffins in almost all of the high street coffee chains but they’ll set you back around 350-500 calories per muffin. These are much lighter at less than 150 calories! I don’t know what I would have done without this little ray of sunshine keeping me going every morning. The last few days commuting from my parent’s house were physically tough but these muffins were the perfect pick me up. A great first post. Simple and delicious and I feel like I could make them right now. Great recipe! Just to say, you can freeze muffins just in case your parents can’t rescue you from temptation next time 😉 – I make 12 and freeze half for the next week. Also how did you get your recipe in that cute box?! I have the same theme as you and have never used that. I se google drive and embed it into the posts text 😀 drop me an email if you want some help!